James Joseph Gandolfini, Jr. (September 18, 1961 – June 19, 2013) was an American movie and television actor. He played Tony Soprano in the HBO television series, The Sopranos. He won three Emmy Awards and a Golden Globe Award for his performance in the role. Gandolfini was born on September 18, 1961 in Westwood, New Jersey. He was raised in New Jersey. Gandolfini studied at Paramus Catholic High School. He grew up in Park Ridge, New Jersey. Gandolfini graduated from Park Ridge High School in 1979. He played basketball and acted in school plays. He won the title "Class Flirt" in his senior yearbook. Gandolfini earned a Bachelor of Arts degree in communication studies from Rutgers University. While at Rutgers University, Gandolfini worked as a bouncer at local school pub. He also worked as a bartender and club manager not including his acting career. He first got his acting job as a young man living in New York City. 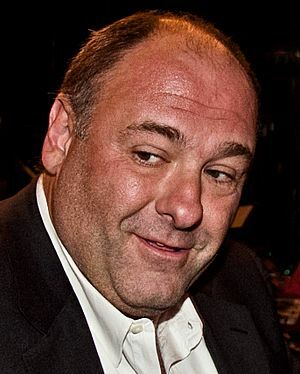 Gandolfini became famous for his role as Tony Soprano, a New Jersey Mafia boss and family man who was the lead character in the HBO drama The Sopranos. The series started in 1999 and ran until 2007. He won three Emmy Awards for "Best Actor in a Drama" for his role as Soprano. Entertainment Weekly listed him as the 42nd Greatest TV Icon of All Time. Gandolfini earned fame for this role, winning both the Primetime Emmy Award for Outstanding Lead Actor in a Drama Series and the Screen Actors Guild Award for Outstanding Performance by a Male Actor in a Drama Series three times. With a career span of 20 years, Gandolfini's other roles include Virgil in True Romance, Bobby Dougherty in Crimson Tide, Bear in Get Shorty, and Carol in Where the Wild Things Are. In 2012, Gandolfini appeared in two major movies, Killing Them Softly and in Zero Dark Thirty. He starred in the main role in the 2013 movie Enough Said. It was released three months after his death. Gandolfini's last movie was the 2014 movie The Drop. Gandolfini was married to Marcy Wudarski from 1999 until they divorced in 2002. He was then married to Deborah Lin from 2008 until his death in 2013. With Wudarski he had a son named Michael (born 2000). He had one daughter with Lin, named Liliana Ruth (born 2012). On June 19, 2013, Gandolfini died suddenly while vacationing in Rome. It wasn't until on June 21 that it was confirmed that he had died of a heart attack. The Sopranos creator David Chase called Gandolfini "a genius" and "his partner and brother". New Jersey Governor Chris Christie said he was "a New Jersey treasure". Gandolfini's body was returned to the United States on June 23. Broadway dimmed theater marquee lights on the night of Wednesday, June 26 in Gandolfini's honor. His funeral was held at Saint John the Divine cathedral in Manhattan, New York on June 27. His remains were later cremated and given to his family. Word of his death spread quickly with many of Gandolfini's friends. Former co-stars, many fans throughout the entertainment business along with politicians such as John McCain and Chris Christie taking to the internet to respond to his sudden death. Christie ordered all State buildings to fly flags at half-staff on June 24, to honor Gandolfini. James Gandolfini Facts for Kids. Kiddle Encyclopedia.